Genekam has developed human antibodies (true antibodies, therapeutic antibodies) against H5N1 and now we are working to generate sufficient quantity to conduct other assays! 3D Genome Medicine Inc. in order to start operations in USA. Shortly website and adress! Genekam is going to open a new company in USA (most likely near Washington DC) to develop, manufacture and distribute its products. Please follow us on our website! Thanks to local Govt and other agencies for excellent support! Genekam Biotechnology AG is a registered supplier of a number of german medical universities and its institutes from last a few weeks. If users of these institutes need the supplier number while ordering, let us know! Mr. Garrelt Duin, Minister of economic Affairs of our state Northrhine-Westphalia, visited our booth on 14.11.2016 at Medica and asked about innovative solutions for viruses and stemcells. Genekam has developed a test for detection of H5N6 influenza virus, which is outbreaking in many countries now. Studies are showing Genekam potential therapeutic molecules are working against Zika virus. Zika Virus-Single Check FR325 now with CE-IVD. Zika Virus-Single Check FR325 is now with CE-IVD. New 4:1 kit Zika virus, Dengue virus (1-4) and Chikungunya virus FR342 (realtime PCR kit) is available now. In 2014 : One of distributors in Middle East told us that one of highest member of rulers of the country thanks him for supporting to combat against Middle East Syndrome Virus (MERS). 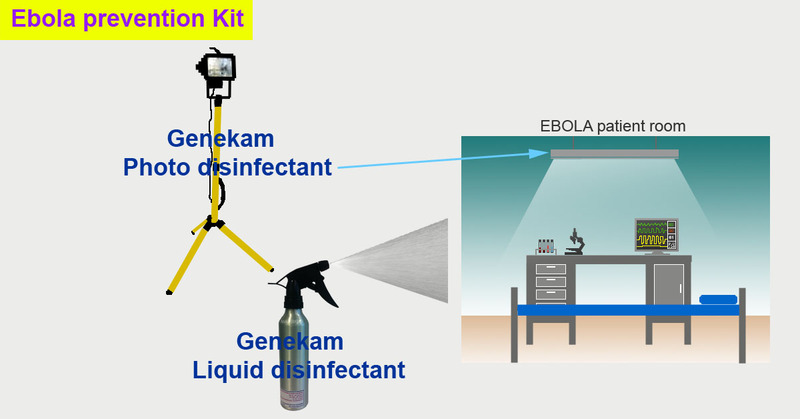 Genekam has developed new Realtime PCR kits for Influenzaviruses of types H4, H6, H8 and H7N9. Genekam Biotechnology AG has launched a new company called MICROBOSS Hightech to serve the market of plant pathology and environmental issues. Genekam Biotechnology AG is a registered supplier of Food and Agricultural Organisation (FAO) and thanks for sourcing kits to combat outbreaks. ZDF-German-TV under Frontal21 has shown a film about Corruption in WHO (World Health Organisation) under WHO-Korruption on 21.10.2014. Please watch it here. Genekam Biotechnology AG has started developing different magnetic beads applications for cellculture, RNA / DNA isolation, protein isolations, transfection etc. Genekam has developed a number of ready to use PCR kits to detect different kinds of corona viruses including SARS virus. The outbreaks of the Middle East SARS virus in Qatar, Saudi Arabia, UAE, Egypt etc need an urgent attention to find out the mode of transmission, source of transmission and other scientific issues. 1 More PCR kit with CE: FR 015 Epstein-Barr-Virus (Realtime PCR kit). Total number of kits with CE are 22 now. 2 More PCR kits with CE: FR 077 Human Swine flu H1N1 (Realtime PCR kit) and FR 799 Identification of a human ß-Actin (Realtime PCR kit). Total number of kits with CE are 21 now. FR 001 Leptospira and FR 118 Human Internal Control (Total number of kits with CE are 19 now). We are going to launch a number of new products for stem cells particularly MSC. Genekam has developed H7N9 PCR kit for detection of recently outbroken avian influenza virus. Start of EU-Project Fibrogelnet under Marie-Curie-IAPP on 7.03.2013. Genekam Biotechnology AG has developed conventional PCR kit for Novel Corona virus (London 2012 strain). This is strain, which has outbroken in Middle east: Qatar and Saudi Arabia. 2 More kits with CE: Ureaplasma urealyticum ready to use PCR kit and cDNA positive control for Influenza H5 (total number of kits with CE are 17 now). 4 More kits with CE: Brucella abortus, Mycoplasma genitalium, Mycoplasma pneumoniae and Borrelia burgdorferi positive control (total number of kits with CE are 15 now). Genekam is to take part in one more project called Fibrogelnet under FP7-PEOPLE-2012-2012 from EU to work on network for development of nanosolutions for nanomedicine. The overall scoring of this project was excellent during evaluation. Two more products (Ready to use PCR kit for Leptospira, kit number K017A and DNA positive control for Leptospira, kit number D0007) are available with CE. Genekam got one project for development of Nanotools for nanomedicine under program ZIM from German Federal Ministry of Economics and Technology. Genekam is to take part in European Community FP7 funded and approved research project called STRUCTGEL to develop nanomedicine applications in Stemcell field.